Well we are still having a fabulous time. We've all been well and have not had any car problems (naturally - it’s a Toyota). In our last newsletter we left you in Port Elizabeth. From there we travelled to Plettenberg Bay and met up with friends of Max and Shiela Newman. We had a lovely time visiting John and Joy Hansen and discussing life in the new South Africa. Also picked up some helpful tips on the good places to visit along the Garden Route. We stayed in a lovely Caravan Park down by the Keurbooms River. Plettenberg Bay is an idyllic coastal town with superb views and lovely coastline. Su-lin enjoyed playing with a nine year old French girl called Melissa who lives at the Caravan Park. From there we travelled to the Heads at Knysna and then onto Wilderness where we camped in a National Park. Met a German couple who also had a rooftop tent. They purchased their 4WD Landrover a number of years ago and return twice a year to spend three weeks touring Southern Africa. Next we travelled through the wine growing areas to Paarl and then onto Cape Town. We are really impressed with Cape Town. It has a beautiful coastline set against the stunning Table Mountains. 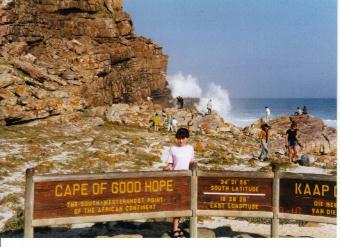 We visited Cape Point and walked to the Cape of Good Hope. Su-lin enjoyed watching the whales in the bay and the baboons pestering the tourists. We visited the Botanical Gardens at Kirstenbosch. It is a magnificent garden, well worth visiting. Whilst Kienny was admiring the flowers and birds, Su-lin and I walked up Table Mountain. We've been staying at Chapman's Peak caravan park which is more like living in a zoo as there are all sorts of animals roaming around. It is a working hobby farm with very friendly managers. The weather for our trip so far has been excellent. Clear skies with temperatures in the late twenties. Sorry to hear the Victorians have been without hot water and living on salads. Why was there no gas? We've had a good time in South Africa - unfortunately we've only seen a few highlights. We'd like to come back and see more on another holiday. Tomorrow we head north towards Namibia. We know that we can access E-mail in Windhoek (capital of Namibia) so we'll send you another update in two or three weeks.